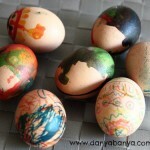 JJ and I had so much fun painting Easter Eggs with cotton tips last week, that we had a go at a few variations. OK, I’ll admit it, I did most of the one on the left. But JJ (my 2 year, 9 month old daughter) totally helped with the two on the right. I asked her which colour she wanted and she chose (developing colour recognition and speech development). 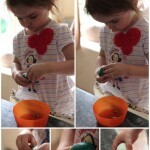 She then opened the glitter glue herself (developing her fine motor skills) and squeezed out about half in one big glob into roughly the middle of one of the eggs. 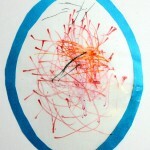 I gave her a paint brush to spread the glitter glue around (more fine motor skills). And it was so much fun that she asked to do a second one! While she was doing the second one, I got started on the bigger one. I quite often ‘work’ alongside JJ in this fashion. I don’t expect her to copy me, but I do like it when she notices if I am doing something slightly different to what she is doing. It shows her variations and techniques without putting pressure on her to be able to do them too. (And in the end JJ did want to help, so she helped me do one of the lines at the bottom). 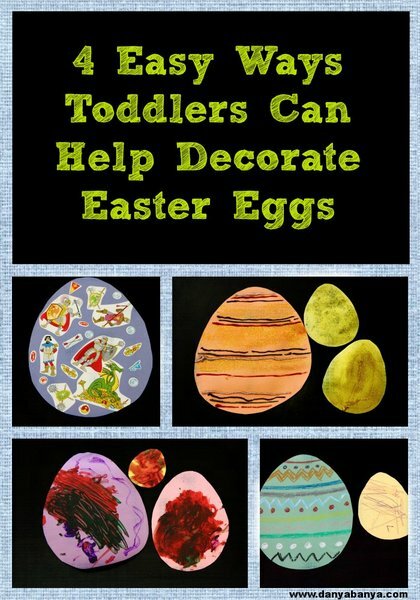 Stickers are the bomb for this age group (and are also great for fine motor development). For a young toddler, I find it’s helpful if you lift up one corner of each sticker. Older toddlers will get the hang of bending the sticker sheet to release a corner of the sticker themselves. I *ahem* might have done most of the one on the left again. But JJ did the one on the right. I like how she’s tried to do horizontal lines like my one. It shows that she’s watching, copying and possibly becoming aware that Easter Eggs tend to have this design. These beauties are almost entirely JJ’s creations. I think I may have done the purple squiggly line on the biggest one only. 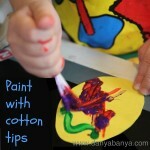 I love the texture that she’s created on the big one using the cotton tips. (I discussed the techniques JJ used for these ones in this post last week). 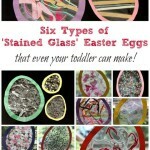 Next: Six types of ‘Stained Glass’ Easter Eggs – that even your toddler can make!